This ACO certificate is ONLY applicable for our Select Organic range of seeds. Compare our brands for more information on the difference between our Select Organic & Eden Seeds brands. 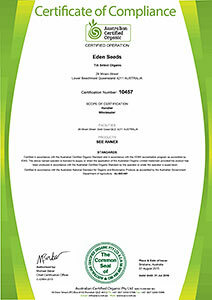 Our current Australian Certified Organic certificate is available for download below. If you cannot open this file, please download Adobe Reader.